"Sudden Impact" is a 1983 American action thriller and the fourth film in the Dirty Harry series, directed by Clint Eastwood (making it the only Dirty Harry film to be directed by Eastwood himself), and starring Eastwood and Sondra Locke. The film tells the story of a assult victim (Locke) who decides to seek revenge on the criminals ten years after the attack by killing them one by one. Inspector Callahan (Eastwood) famous for his unconventional and often brutal crime-fighting tactics is tasked with tracking down the serial killer. As Callahan investigates the killings, he becomes romantically entangled with the woman, not knowing that she is responsible for the murders. The film is notable for the catchphrase, "Go Ahead, Make My Day", which is uttered by Clint Eastwood's gun-wielding character in the beginning of the film as he stares down an armed robber who is holding a hostage. 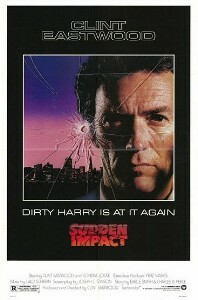 Lalo Schifrin - Sudden Impact and the Best of Dirty Harry (Soundtrack). German Warner Bros. 923 990-1 stereo (1983).